‚…I read it and reread it, and wept and laughed and trembled with horror which at all times assails me yet‘. With its strange, imaginative blend of horror, sicnece fiction, romance and lyrical prose, Robert W. Chambers‘ The King in Yellow is a classic masterpiece of weird fiction. This series of vaguely connected stories is linked by the presence of a monstrous and suppressed book which brings fright, madness and spectral tragedy to all those who read it. An air of futility and doom pervade these pages like a sweet insidious poison. Dare you read it? This collection has been called the most important book in American supernatural fiction between Poe and the moderns. H. P. Lovecraft, creator of the famed Cthulu Mythos, whose own fiction was greatly influenced by this book stated that The King in Yellow ‚achieves notable heights of cosmic fear‘. vor einiger Zeit habe ich den Namen Robert W. Chambers in einem Satz mit H.P. Lovecraft gelesen, weswegen ich unbedingt mal etwas von deinem Autor lesen wollte. Da kamst du mir als Kurzgeschichtensammlung ganz gelesen, um einen Einblick in seine Werke zu erhalten. It was just another day in the life f a small Atlantic resort until the terror from the deep came to prey on unwary holiday makers. The first sign of trouble – a warning of what was to come – took the form of a young woman’s boday, or what was left of it, washed up on the long white stretch of beach. A summer of horror had begun. First published in 1974, Jaws represented a terrifying high point of the disaster genre. It has sold over twenty million copies worldwide and given us a legend that refuses to die. In the six months since Anthony, Lucy, and George survived a night in the most haunted house in England, Lockwood & Co. hasn’t made much progress. Quill Kipps and his team of Fittes agents keep swooping in on Lockwood’s investigations, which is creating a bit of tension back home at Portland Row. Things look up when a new client, Mr. Saunders, hires Lockwood & Co. to be present at the exhumation of Edmund Bickerstaff, a doctor who, in Victorian times, purportedly tried to communicate with the dead. Saunders needs th coffin sealed with silver to prevent any supernatural trouble. All goes well – until George’s curiosity attracts a horrible phantom. The autor of the blockbuster Bartimaeus series delivers another amusing, chilling, and ingeniously plottet installment in the critically accalimed Lockwood & Co. series. A sinister Problem has occured in London: all nature of ghosts, haunts, spirits and Specters are appearing throughout the city, and they aren’t exactly friendly. Only young people have the psychic abilities required to see – and eradcate – these supernatural foes. Many different psychic investigation agencies have cropped up to handle the dangerous work, and they are in fierce competition for business. In The Screaming Staircase, the plucky and talented Lucy Carlyle teams up with Anothy Lockwood, the charismatic leader of Lockwood & Co., a small agency that runs independent of any adult supervision. After an assignment leads to both a grisly discovery and a disastrous end, Lucy, Anthony, and their sarcas-tic colleague, George, are forced to take part in the perilous investigation of Combe Carey Hall, one of the most haunted houses in England. Will Lockwood & Co. survive the Hall’s legendary Screaming Staircase and Red Room to see another day? Readers who enjoyed the action, suspense, and humor in Jonathan Stroud’s internationally best-selling Bartimaeus books will be delighted to finde the same ingredients, combined with deliciously creepy scares, in this thrilling and chilling Lockwood & Co. series. Jack Torrance’s new job at the Overlook Hotel is the perfect chance for a fresh start. As the off-season caretaker at the atmospheric old hotel, he’ll have plenty of time to spend reconnecting with his family and working on his writing. Bu as the harsh winter weather sets in, the idyllic location feels ever more remote … and more sinister. And the only one to notice the strange and terrible forces gathering around the Overlook is Danny Torrance, a uniquely gifted five-year-old. 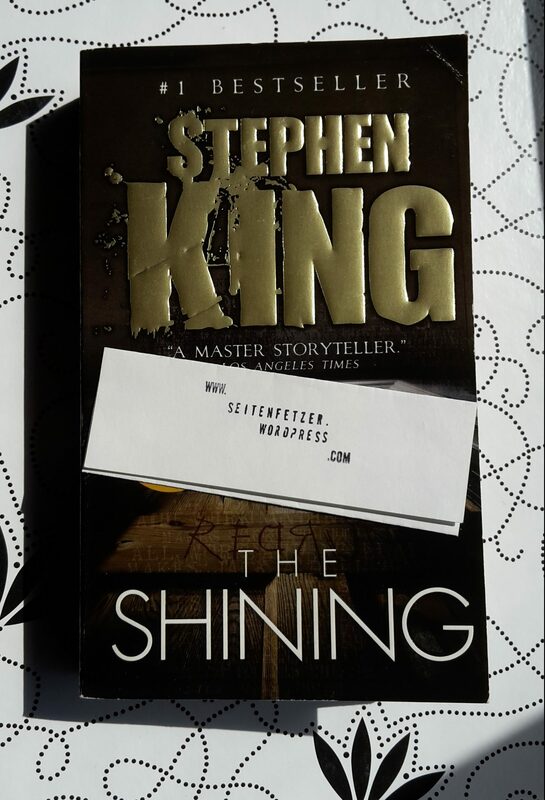 Mit The Shining liefert King eigentlich die typische Geschichte über ein Spukhaus. Trotzdem hat er es geschafft, mich tief in die Geschichte hineinzuziehen.